Remember when Big Bang and DBSK were the dominating groups in K-pop? The good ol’ days without autotune and people actually singing. Anyways, I like the original R&B sound that Big Bang had like with this album instead of their latest Japanese singles that are pretty much an autotune fest. 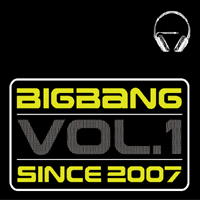 Big Bang debuted with ‘Since 2007’ , a album with heavy R&B influences. It was mostly written by G-Dragon, but he also had some help from the other members. The album was released December 2006. It sold 110,408 copies and reached the number 1 spot on the weekly charts. Big Bang (Intro) nice R&B/ rap intro, but I really don’t understand the point of it. She Can’t Get Enough reminds me of the early 2000 boy bands in America like B2K. Dirty Cash starts off with some guitar, more gritty sound with TOP leading the rap. I know they wanted to sound diverse but this doesn’t sound very good with the other voices added in the background. The Next Day /다음날) (Seungri solo) an okay track, standard pop ballad. Big Boy (T.O.P solo) I enjoy the break in the intro where there’s some beatboxing. I like the theis TOP when he didn’t have to resort to name dropping ala Turn It Up. Shake It/흔들어 (featuring Ji Eun) reminds me of 2NE1’s Try to Copy Me during TOP’s intro. 눈물뿐인 바보/A Fool’s Only Tears I wish they would’ve stuck with this R&B style. This will always be my favorite song from them. It really shows off Daesung and Taeyang’s vocal range. There’s also a short rap from G-Dragon and some narration from TOP in the beginning and ending of the track. The album finishes with solo tracks from Daesung,Taeyang and G-Dragon starting with Ma Girl (Taeyang solo). Taeyang’s voice isn’t developed, but it is a nice R&B track. Not the best considering it’s a debut album and he was still finding his voice. La-La-La brings back memories of their reality show when YG was choosing who he wanted to be ‘Big Bang’. It has a mix of R&B and hip-hop, very catchy. This also reminds me of B2K. This Love (G-Dragon solo) is the Korean version of ‘This Love’ by Maroon 5. I don’t really like it because G-Dragon’s “singing” is nasal/ borderline whiny, the rapping is good. I keep expecting Adam to jump in and sing the chorus. 웃어본다/Try Smiling (Daesung solo) I love the deepness of Daesung’s voice; I need an actual solo album from him, not that Cotton Candy crap either. He is arguably the best singer in the group. Taeyang has a good voice, but his voice can get nasal especially when he does the vocal acrobatics. Overall, I enjoyed listening to Since 2007. There’s a good balance of R&B and hip-hop. Some of the songs I recommend are ‘A Fool’s Only Tears’ and Shake It . I rate this 3.5/5. Let’s just hope that their comeback next year will be even better. yeah i agree with you, i wish they would return to their old ways. but out of this album, i only really like A Fool’s Only Tear, La La La, and The Next Day. the others i’ve listened to and what not, but they don’t really catch me though. hopefully when they make a comeback soon next year… it’ll have some stuff i can enjoy. and i do agree, Daesung’s vocals is much preferred then Taeyang’s.